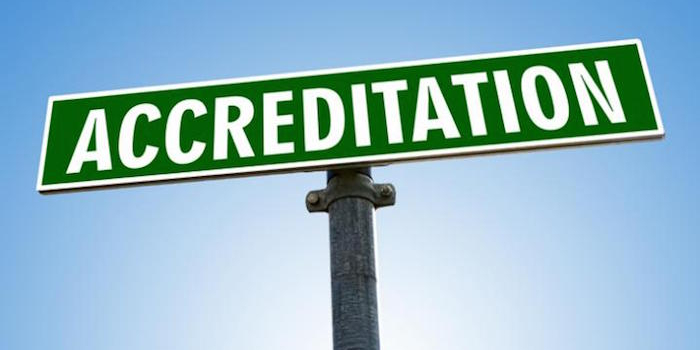 Accreditation is official recognition of having met a standard or criterion. If you are entering the business world, the technology sector, the medical field or just about any professional career, the hiring company will almost always require a degree from an accredited college or program. Not only does your post-college career depend (in part) on whether you graduate from an accredited or non-accredited college, but the schools’ accreditation status may also affect your pre-college decisions—particularly in the area of finding the funds to finance your education. Here’s why: In order to be eligible for federal student financial assistance programs, your college of choice must be accredited by an accrediting agency recognized by the U.S. Department of Education (USDE). Accrediting agencies that are recognized by the U.S. Department of Education have been determined to be reliable authorities as to the quality of education or training provided by the institutions of higher education and the higher education programs they accredit. The Secretary of Education deems these agencies credible based on a long list of mandatory criteria outlined here. Once an agency has met certain criteria, the Secretary of Education will add it to a published list of U.S. Department of Education recognized accrediting agencies. The accrediting agency then has the authority to assess institutions of higher education to ensure that the education provided by these institutions “meets acceptable levels of quality.” These levels of quality are set forth by the accrediting agency and are in line with the Higher Education Act of 1965 (HEA). According to the USDE, schools that have been accredited by a recognized accrediting agency are constantly monitored and reevaluated to ensure that the school continues to meet the agency's standards and to ascertain whether continuation of its accredited or pre-accredited status is warranted. These agencies are also recognized by the Council for Higher Education (CHEA). More on this later. National accreditation means the school has been accredited by an agency that evaluates specific types of schools such as career schools, religious schools, distance education colleges, online schools, and many other non-traditional learning institutions, regardless of geographic location. Both regional and national accrediting agencies offer voluntary accreditation. Further, the process to earn accreditation from either type of agency is rigorous, and both nationally and regionally accredited colleges may offer financial assistance through the federal financial aid program if they are USDE recognized. One drawback to attending a regionally accredited school versus a nationally accredited school is transferability. Some credits may transferto other regionally accredited schools only. Nationally accredited schools, on the other hand, will accept credits from both regionally and nationally accredited colleges as well as regionally accredited online schools. There are literally hundreds of online MBA programs offered at schools across the U.S. and abroad, and they may hold just about any type of accreditation. The most recognized accreditation, however, is accreditation granted by a U.S. Department of Education (first) and/or the Council for Higher Education (CHEA), second. According to the Council for Higher Education Accreditation, some accrediting agencies have chosen not to pursue USDE recognition for various reasons, while others simply cannot be considered for USDE recognition because they do not provide access to federal funds. In these cases, agencies may pursue CHEA recognition. To become a CHEA-recognized accrediting organization, certain mandatory criteria must be met. The criteria (and goals) are very similar to the USDE’s. The Council for Higher Education Accreditation describes itself as a national advocate and institutional voice for self-regulation of academic quality through accreditation. It is an association of 3,000 degree-granting colleges and universities and recognizes 60 institutional and programmatic accrediting organizations. Although not affiliated with the USDE, the CHEA lists both USDE-recognized and CHEA-recognized accrediting agencies, and it updates the list each time an agency has been added or removed. It is important to note that the AACSB was formerly recognized by the USDE. Many prestigious colleges and universities also offer “hybrid” AACSB-accredited MBA programs. A hybrid program offers a combination of online and on-campus courses. UCLA Anderson School of Management (as of fall 2012) and Cornell University Samuel Curtis Johnson School of Management are just a few renowned universities that offer this fast-growing format. A number of other reliable accrediting agencies accredit some of the nation’s top MBA and Online MBA programs. The following is a list of agencies (along with a description of each) to look out for when researching Online MBA programs. The ACBSP was the first agency to offer specialized business accreditation at all degree levels. Recognized by the CHEA in 2001 and 2011, the ACBSP’s mission is to promote “continuous improvement of business education programs around the world.” The Agency has a vision to accredit every quality business program worldwide. Today, the ACBSP accredits business, accounting, and business-related programs across the globe at the associate, bachelor’s, master’s, and doctoral degree levels. The IACBE was established in 1997 to address the problem of business programs in the U.S. that “were not recognized and could not become recognized by existing accrediting bodies.” Since then, the IACBE has grown to 200 members and 800 accredited programs in the U.S. and around the world. This CHEA-recognized agency has a primary purpose of promoting excellence in teaching and learning. The IACBE accredits business programs that lead to degrees at the associate, bachelor’s, master’s, and doctoral degree levels at institutions of higher education worldwide that grant bachelor’s and/or graduate degrees. The MSA accredits colleges and universities, community colleges, public, private, parochial and charter K-12 schools and school systems, online/distance learning programs, learning & tutoring centers, technical and vocational schools, and preschools. CHEA recognition allows the MSCHE to accredit degree-granting institutions which offer one or more post-secondary educational programs of at least one academic year in length. The Commission conducts accrediting activities in the same states listed above, and in other geographic areas in which it conducts accrediting activities. Founded in 1926, the DETC is a Washington D.C. based non-profit [501 c 6] educational association. Its mission is to “promote sound educational standards and ethical business practices within the correspondence field.” The DETC states that it defines, maintains, and promotes educational excellence in distance education institutions, and is dedicated to fostering quality assurance, protection of the rights of the students, and institutional self-improvement through voluntary accreditation via peer evaluation. The Distance Education and Training Council accredits learning institutions that award associate, bachelor’s master's, first professional, and doctorate degrees and that offer programs conducted primarily through distance learning (51 percent or more). Founded in 1895, the NCA-HLC is an independent corporation that accredits degree-granting post-secondary schools in the North Central region. This accrediting body has affiliations with more than 1,000 schools. The NCA-HLC accredits schools in Arizona, Arkansas, Colorado, Illinois, Indiana, Iowa, Kansas, Michigan, Minnesota, Missouri, Nebraska, New Mexico, North Dakota, Ohio, Oklahoma, South Dakota, West Virginia, Wisconsin, and Wyoming. The NCACS has three clearly defined goals: (1) to support an educational process which is alternative in intention, working to empower people to actively and collectively direct their lives; (2) to support an educational process which is alternative in form, requiring the active control of education by students, parents, teachers and community members who are most directly affected, and (3) to support an educational process which is alternative in content, developing tools and skills to work for social justice. The New England Association of Schools and Colleges has been in existence since 1885—making it the oldest regional accrediting association in the U.S. Its mission is “the establishment and maintenance of high standards for all levels of education, from pre-K to the doctoral level.” This self-regulatory membership organization serves more than 2,000 public and private schools, colleges, and universities in six states including Connecticut, Maine, Massachusetts, New Hampshire, Rhode Island, and Vermont. The NEASC also accredits schools in more than 67 nations around the world. The NWCCU has been recognized by the U.S. Department of Education since 1952. The goal of the Commission is to formally recognize “higher education institutions performance, integrity, and quality to merit the confidence of the educational community and the public.” This private 501(c)(3) non-profit corporation accredits schools in Alaska, Idaho, Montana, Nevada, Oregon, Utah, and Washington. Established in 1895, the mission of the Southern Association of Colleges and Schools is “to assure the educational quality and improve the effectiveness of its member institutions” in the Southern states through accreditation. The Association accredits schools that award associate, bachelor’s, master’s, and/or doctoral degrees. States served by the SACS include Alabama, Florida, Georgia, Kentucky, Louisiana, Mississippi, North Carolina, South Carolina, Tennessee, Texas, and Virginia. Note from the Council for Higher Education: Because CHEA affiliation and USDE recognition depend on a range of factors, readers are strongly cautioned against making judgments about the quality of an accrediting organization and its institutions and programs based solely on CHEA or USDE status. Additional inquiry is essential. If you have questions about the CHEA or USDE recognition status of an accreditor, please contact the accrediting organization.